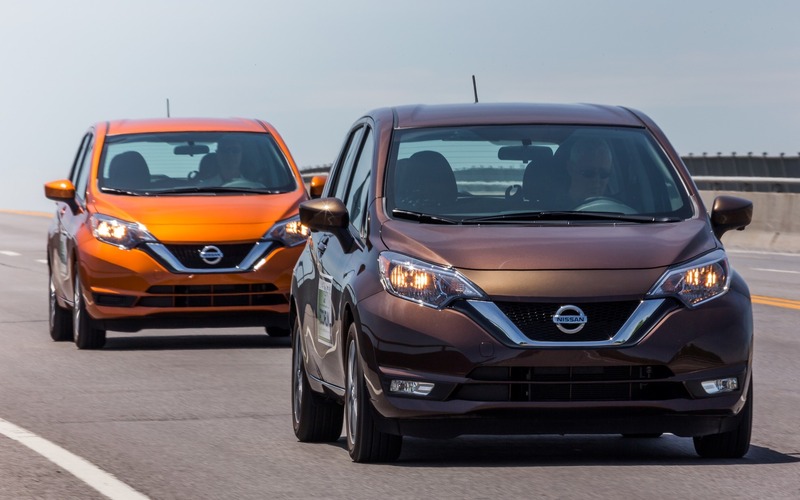 Usually, when Nissan Canada participates in AJAC’s EcoRun, it brings along a fully electric Nissan LEAF in order to boast its driving range and comfort. However, this year, the automaker decided to enter two units of the 2017 Nissan Versa Note instead, one with a manual transmission and the other with an automatic, as well as a 2017 Nissan Pathfinder Midnight Edition. The reason why Nissan didn’t enter its electric car is simple. The second-generation LEAF will be unveiled within the next couple of months, so the company preferred giving a chance to the Versa Note to shine. The two-day 2017 EcoRun event started in Ottawa and concluded in Quebec City, passing through Montreal where journalists slept overnight. During the first portion of the second day of driving, from downtown Montreal to Joliette, it got to take the wheel of the manual-gearboxed Versa. Obviously, escaping the city in morning rush-hour traffic is never an easy or quick task. And it’s pretty tough to eco-driving when we’re stuck in said traffic. However, once we reached Highway 40 East to head towards Joliette, the Versa Note’s average started to drop gradually. In fifth gear, the engine spins at close to 3000 rpm, but the car was nonetheless quiet inside. By maintaining a cruising speed of 95 km/h, I concluded the trip with an excellent average of 4.7 L/100 km. The car boasts city/highway/combined ratings of 8.6/6.6/7.7 L/100 km. Overall, after the eight portions of the drive event, each with a different journalist at the helm, the manual Versa Note consumed fuel at a rate of 5.4 L/100 km. During the second portion of the day, from Joliette to Trois-Rivieres, I switched over to the Versa Note equipped with the continuously variable automatic. I kept the same cruising speed on the highway, and upon arriving at my destination, my average indicated 5.8 L/100 km. It was a little surprised, since the automatic Versa has city/highway/combined ratings of 7.6/6.2/7.0 L/100 km, below those of the manual-gearboxed car. However, 5.8 is still a very good result, right? For the rest, the 2017 Nissan Versa Note remains one of the most spacious subcompact cars on the market, especially for rear-seat occupants. The car’s trunk is also very roomy, although the rear seatbacks don’t fold to create a flat load floor like in its rival, the Honda Fit. Its 1.6-litre four-cylinder engine develops 109 horsepower, below average for its segment, but the car doesn’t feel lethargic on the road. The Versa’s biggest drawback is its numb on-centre steering feel, which lowers its fun-to-drive quotient. The Versa Note starts out at $14,498 before freight and delivery charges. At that price, air conditioning and Bluetooth connectivity come standard, a noteworthy advantage compared to its category rivals. This year, Nissan introduced the 2017 Qashqai, a vehicle that is expected to quickly become one of the brand’s bestsellers. Its unusual name (which is practically begging for spelling mistakes) comes from a group of Turkish tribes that live primarily in Iran. So is the 2017 Qashqai all-new? Not really.